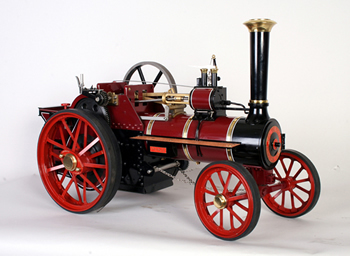 This engine is an accurate model based on the Burrell Agricultural Engine Prince a 7hp single cylinder Tractor, Works No.3728. Delivered new on the 23rd of August 1916 to J.Hardy of Blackmore, Essex, the engine survives in good working condition and is to be seen regularly at steam rallies up and down the country during the summer months. With its open motion, spoked flywheel and lack of cover for the driver this is the traction engine in its most basic form. Prince remains largely original, as can be seen from the recent photo on this page. Because of the relatively high initial cost of Agricultural engines, many smaller farmers could not afford to buy their own, useful though they were. It was not uncommon therefore, for farmers to engage the services of a local contracting gang who would, in the summer months, set about the annual tasks of threshing, baling, sawing etc and come autumn - ploughing the fields (using "roundabout" windlass tackle), ready for the next seasons crop!